"If Haze had an evil big brother… Very Hazy conveys all the beautiful flavors of Haze, but with even greater depth, potency, and hop insanity. In short, it contains the most liberal application of hops in our short history. A pungent citrus juice aroma primes the senses for the intense flavor to follow. We taste pulpy orange, peach, and a melange of tropical fruit. Just the right amount of bitterness graces the palate while a sensual mouthfeel make you easily (and dangerously!) forget this one clocks in at 8.6% ABV. A beautiful and unapologetic mess of a beer, and one we are excited to have back!" Sometimes you're just in the right place at the right time. As I write this, I am just a few hours removed from another trip to Tree House Brewing, but today was special as I was starting my birthday celebration a day early. A trip to Monson, MA was already planned and while I knew Tree House would be canning and putting another beer on draft for Thursday, I had no idea what it would be. As I got in line at 3:17pm (#57...yes, even on a Thursday), I waited until the doors opened. Suddenly, before 4:00, the list for the day was announced by a member of the Tree House crew and the new beer for today was VERY HAZY. While I do not know the last time this was brewed, I do know it has been a significant amount of time since this one saw a release (and now in cans!). The crowd erupted with elation, people started calling their friends telling them to get down to the brewery, and a few assholes probably created a listing on an auction site to sell their 3-can allotment for $100. I can't say this is an Imperial version of Haze because Haze is already an Imperial IPA, but apparently Tree House found a way to make Haze even bigger. I always like to do a special beer for my birthday review and to be honest, I was having some difficulty figuring out what it would be this year. Since this just happened to fall into my lap, I figure I had to do it. So, come with me as I celebrate my 31st year on planet Earth with a beer that has been hyped to the moon. It wouldn't be a New England IPA without a hazy (pun intended) golden orange body and two fingers of white head. A delicious bouquet of melon and orange sherbet greet me on the aroma along with orange zest and a little pop of bitterness. Very well-rounded and similar to the standard Haze. Based on the aroma and the fact that the abv is only slightly higher than the standard Haze, I expected the taste to follow the same path as it's younger brother. Now, I hate to be one of those people who generalize and say this is an amped-up version of a beer by saying this is Very Haze is Haze on steroids, but one sip in and yeah, this thing has an intensified taste and feel when compared to the base beer. The taste is basically peach puree drenched in fresh-squeezed orange juice. Maybe it's even like chewing a mouthful of Juicy Fruit gum while eating an orange. While I tend to associate an orange creme or sherbet taste to stellar New England IPA's, this one not only has that, but instead of a sugary, dessert-like taste, it is pure citrus juice. Just throw some ice and oranges into a blender and you'll get the same result. The back end has a noticeable hop juice and bitterness quality which adds another element to the beer and makes it more than just citrus. The bitter hops have almost a dank quality to them like Mosaic, but no resin. It's fantastic and delicious. Mouthfeel is so creamy, soft, and pillowy that you'd think this was on nitro, but it isn't. You're basically drinking a fluffy cloud. I'd have to agree with the brewer's description and say that the abv is undetectable and yes, my 16oz can was gone in a flash. If you know me, you know I don't like buying into hype. In fact, if a beer is usually hyped up then I will find it disappointing no matter how much I like it. 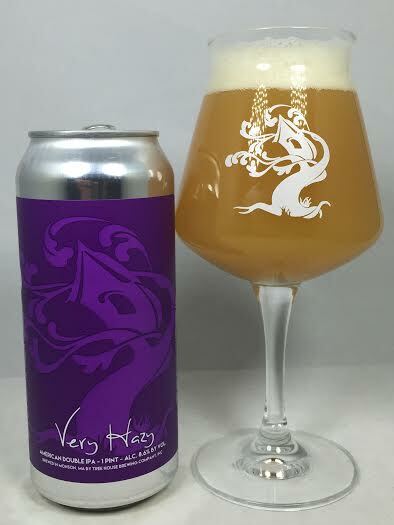 Very Hazy is one of my lone exceptions as everything I liked about Haze is here, but has been jacked up to Reptar-sized proportions. I think this might be the best Tree House IPA I have reviewed, and since I know getting my hands on it again might be impossible, I will savor every moment I have with it now.